By Sonya Lunder, Senior Analyst, EWG Toxic pollutants in drinking water are particularly hazardous for children. Compared to adults, children drink more water per pound of body weight, resulting in greater exposure and greater risk. They’re also more vulnerable to harmful contaminants because their bodies are still growing and toxic chemicals cause more harm to developing organs and tissues. EWG set out to find which tap water contaminants pose the greatest risks for children in America today. 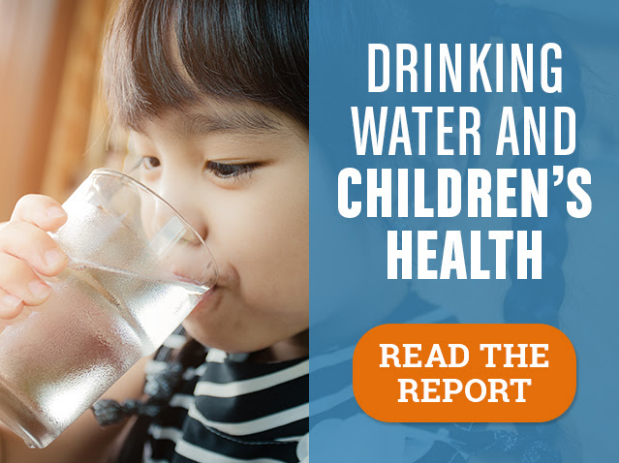 We reviewed drinking water reports from nearly 50,000 water companies or utilities nationwide, collected between 2010 and 2015, and compared test results to science-based health guidelines. At least 45 contaminants linked to hormone disruption. For some chemicals, researchers don’t know if or how exposure can affect a child’s development or harm the finely balanced hormonal system because subtle alterations can be hard to detect. The data collected by EWG may be an underestimate of the full range of health concerns for drinking water contaminants. Tap water and bottle-fed babies Water contamination is especially concerning for bottle-fed infants. A baby fed exclusively powdered formula mixed with tap water drinks the most water for its small size of any age group. Tap water can be 85 percent of a formula-fed baby’s diet, and this period of intense exposure can last four to six months, until parents start supplementing formula with food. Here are five contaminants to watch out for: Lead A potent neurotoxin, lead is particularly harmful during pregnancy and early childhood. Old, corroded lead pipes and plumbing are common sources of lead in drinking water, and additional exposures come from paint, soil and contaminated household dust. Under the federal Lead and Copper Rule, if lead concentrations exceed an action level of 15 parts per billion, or ppb, in more than 10 percent of sampled homes, the water utility must apply measures to control lead leaching from the pipes. However, there is no amount of lead exposure scientists consider safe. Recent Environmental Protection Agency modeling suggests that lead concentrations in excess of 3.8 ppb could boost some children’s lead exposure above acceptable levels. Meanwhile, the Food and Drug Administration limits lead in bottled water to 5 ppb, and California has set a public health goal of 0.2 ppb lead in tap water to protect children’s’ brains and prevent the loss of IQ points. The data collected by EWG show that more than 19,000 U.S. water utilities have reported some residences with lead levels exceeding 3.8 ppb between 2010 and 2015. Lead levels vary from house to house based on the presence of lead in pipes and solder. Tests performed in your city might not reflect specific lead risks in your home. If you are pregnant or have young children, consider having your tap water tested for lead. 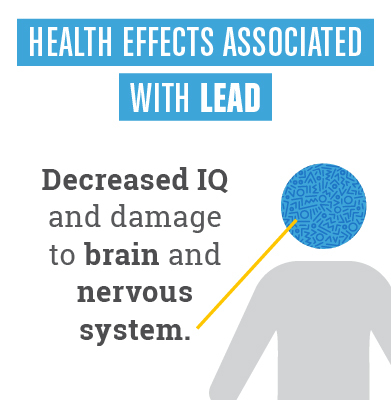 Read more about lead in drinking water. 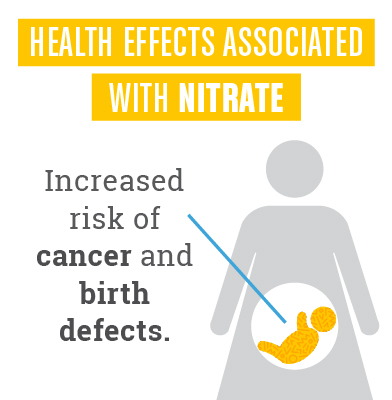 Nitrate The federal government allows up to 10 parts per million, or ppm, of nitrate in water, but EWG recommends that nitrate levels should not exceed 5 ppm, based on emerging evidence that nitrate causes problems during pregnancy and could increase risks of cancer. In excess of 10 milligrams per liter, nitrate can block the blood’s ability to carry oxygen, which can severely harm bottle-fed infants. EWG data show that in 2015, 7 million Americans drank water with nitrate levels at an average of 5 ppm or greater, exceeding the level the National Cancer Institute research shows increases the risk of cancer. Additionally, many Americans drink nitrate-contaminated water from private wells, which are not routinely monitored for contamination. Read more about nitrate in drinking water. Atrazine Atrazine, an herbicide linked to hormone disruption, is found in the water supplies of at least 30 million Americans. Federal laws allow up to 3 ppb of atrazine in treated tap water, but human epidemiological studies suggest that federal standards for atrazine are inadequate to protect public health. In agricultural areas, atrazine and nitrate are frequently present together in drinking water, and the mixture of the chemicals could have a cumulative effect. Researchers from the University of Illinois reported a statistically significant association between the presence of atrazine in drinking water and preterm births. The average concentration of atrazine in the study was one-seventh of the federal legal limit. The same research team found that the effect may be exacerbated by the simultaneous presence of nitrate. 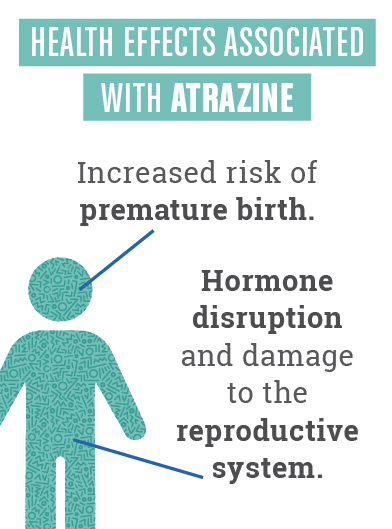 Scientists don’t know exactly how atrazine affects the developing fetus or infant, but the risks from even low levels of exposure are clear. In 1999, scientists in California Office of Environmental Health Hazard Assessment set a public health goal of 0.15 ppb for atrazine in drinking water. EWG recommends people filter drinking water if it contains atrazine concentrations above this amount. Read more about atrazine in drinking water. Manganese Manganese is a naturally occurring metal, found in food and water, and may be added to food supplements. It leaches from rocks and soil into drinking water. 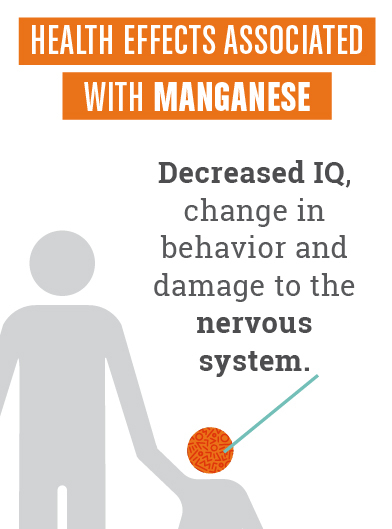 Several recent studies show lower IQ scores, and lower verbal and behavioral performance scores in children who live in areas with higher concentrations of manganese in water. Scientists remain puzzled by the fact that manganese also occurs naturally in food, but food doesn’t seem to be associated with the same harmful effects. EWG supports the state of Minnesota’s guideline that formula-fed babies not drink water with more than 100 ppb of manganese. Manganese in excess of this level is found in water served to more than 10 million Americans. Read more about manganese in drinking water. Fluoride Unlike other chemicals monitored by water systems, fluoride is intentionally added to drinking water, even though research clearly shows that fluoride is most effective when used topically in toothpaste and not ingested. In 2011, responding to a lawsuit by EWG and other advocacy groups, the Department of Health and Human Services recommended that water utilities reduce the amount of fluoride added to water to 0.7 ppm – down from the previous federal recommendation allowing up to 1.2 ppm fluoride in drinking water. This new recommendation took effect in 2015. 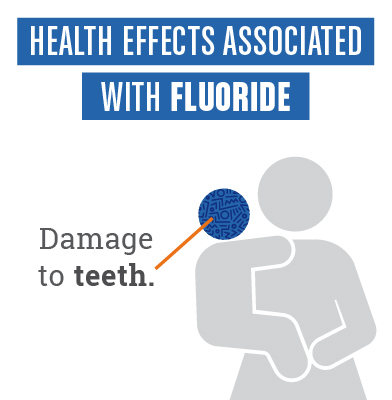 The Centers for Disease Control and Prevention state that if infant formula is mixed with fluoridated water, the baby’s teeth might be affected by dental fluorosis, which appears as white spot markings on the teeth. EWG recommends that baby formula be mixed with fluoride-free water, especially for infants whose diet is exclusively powdered baby formula. Federal drinking water regulations do not protect children EWG believes that federal drinking water regulations must give special consideration to the exposure and toxicity of drinking water contaminants for young children. Yet, many existing national drinking water standards have been developed for an adult weighing 70 kilograms, or 154 pounds – not for a child or an infant. That’s why we published our own EWG Standards, which are limits drawn from the best scientific research that put children’s health first. What can I do to protect my kids from tap water contaminants? The best way to reduce your children’s exposures to harmful chemicals in drinking water is to install an effective in-home filter. Look to the EWG Water Filter Guide to find the right filter to remove the specific contaminants in your water and fit your budget. For atrazine and lead: Even a simple countertop pitcher with a carbon filter can work. For fluoride, manganese and nitrate: Reverse osmosis is the most reliable system for removing these contaminants. Click here to see reverse osmosis filters. And after you get a filter for your home, don’t stop there. Reach out to local, state and federal officials to ask them hard questions about water quality, and hold them accountable for making sure all American children have safe water in their homes. Click here to see EWG guide, “7 Questions to Ask Your Elected Officials About Tap Water.” Look out for future research from EWG on tap water In the coming months, EWG will publish a series of reports for parents, future parents, and everyone interested in children’s health and drinking water. Look for advice on drinking water during pregnancy and nursing, information on contaminants to avoid, the latest research on chemicals in water such as hormones and hormonal disruptors, and how we can make children’s health a priority in national drinking water policy.